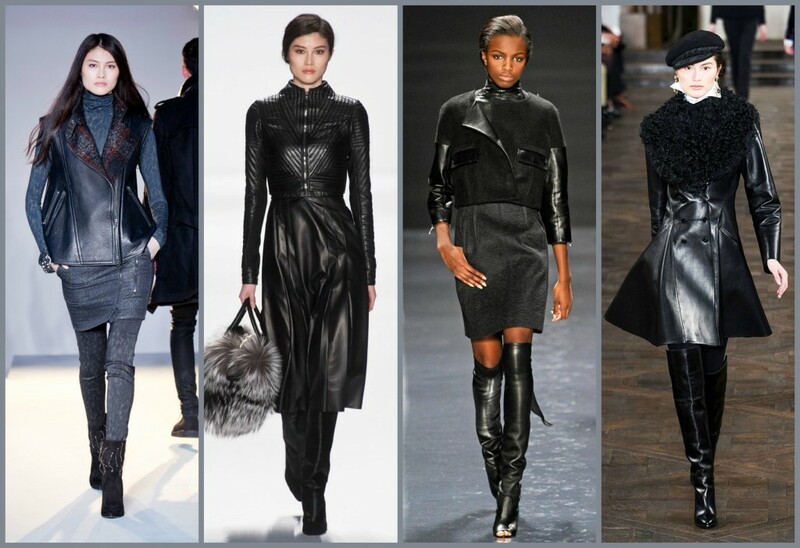 In continuation of our Fall Fashion Fabric Guide series, we now bring our attention to leather. A stand-alone statement piece or used in a hybrid form with other fabrics, leather was this year’s “it” material. Leather is traditionally associated with a biker or rocker vibe, but this season, designers quilted it, used as trim or paneling, and fashioned into sleek silhouettes to present it in a more sophisticated light. This material is an animal hide, not derived and woven from plant materials; therefore is prone to some imperfections. A leather tanner will treat and color the materials to hide much of these imperfections, but over time, these treatments will wear away, re-exposing them, much in the same manner that makeup covers up blemishes but wears off over the course of the day. Many professional cleaners recommend recoloring after cleaning to replace the finish that is naturally lost over time. With leather and suede, it’s especially important to store in a cool place over the summer months. Hides will stiffen from heat and humidity. These materials are also more susceptible to moth damage. That being said, never store in plastic, for this will only trap in heat and moisture. A muslin cover stored indoors is the best alternative. In case you missed it, check out the other Fall Fashion Fabrics in this Series by clicking here: Part One – Knits.